F100-200 installed in the test position. Close-up of the F100-200 mounted on the test stand. Click here for video of an internal view of the afterburner in operation taken with the water-cooled tailpipe camera. The flashing prior to afterburner lightoff is the igniter plug. The turbine starts to glow as military power is selected just prior to afterburner lightoff. 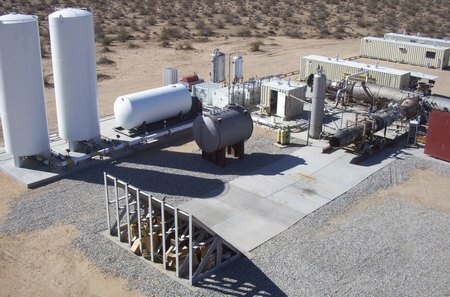 Images to the left show a Jet Engine research facility built by Spath Engineering in partnership with MSE Technology Applications of Butte, Montana and ATK-GASL of Ronkonkoma, New York for the Defense Advanced Research Projects Agency. 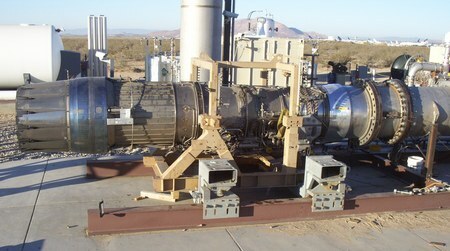 Innovative techniques were applied to a General Electric J85-5 and Pratt and Whitney F100-200 to extend their Mach number range. Mass Injection Pre-Compressor Cooling system mounted on the inlet duct for the F100-200. F100 running augmented (afterburning) at Mojave test site. 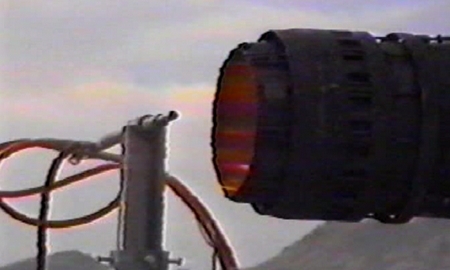 This photo shows the water-cooled tailpipe camera that is able to internally image the afterburner combustion. The gas in the plume impinging on the camera probe is 3,200° F.